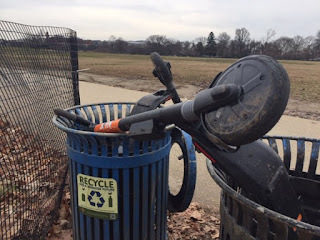 Who is actually assuring that all those vandalized scooters being returned to service are safe? "I’d hopped on various models with broken brakes before, only to swiftly hop off and park safely. I’d heard others complain about sticky accelerators. This sudden motor failure, however, was new." The scooter industry’s approach to safety has seemed more in the “move fast and break things” spirit. The user agreements that all riders must sign are clear about rider risk assumption: Riders must agree that they understand that the activity they’re engaging in is potentially dangerous, and that they’re deciding to play anyway. The major companies—such as Bird, Lime, and Scoot—do have in-app safety tutorials, though you can scroll through quickly before registering. In those same user agreements, riders are encouraged to wear helmets; research shows, however, that companies’ social media accounts rarely promote the practice. More paradoxically, Bird handed out 50,000 free helmets to riders this year—even as it allegedly served as a key sponsor behind a California bill removing the helmet requirement for scooter-riders over 18, which passed this September. “The outcome of this legislative process will not change Bird's ongoing efforts to promote the safe riding of our vehicles. We strongly encourage all riders to wear helmets,” a Bird spokesperson said. The next day, I called Paul Zukerberg, an attorney for the D.C. firm Zukerberg and Halperin Associates, which has an entire page of its site devoted to scooter injuries. I assured him I didn’t want to sue, and that I had no medical bills to cover. But if someone hypothetically did, “there’s not much they can do,” he told me. The legal tussles can also affect city regulations. New York City has banned all scooters from operating in the city, in part because of concerns about adding to the mayhem of Gotham’s crowded sidewalks—though a few city councilors are hoping to change that with forthcoming legalization bills. Other cities have entered into exclusive contracts with some scooter companies and not others. 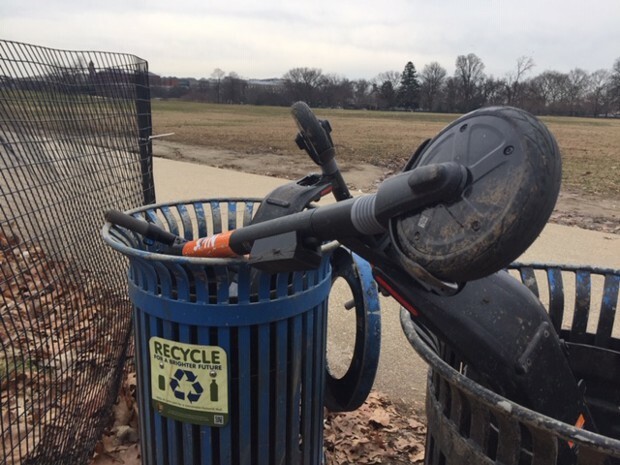 That’s the case in San Francisco, where Bird and Lime are forbidden, but rivals Scoot and Skip can operate, partly because of their professed commitment to community engagement and rider-safety training. (And partly because they “played extra nice,” according to Wired.) And after getting hit with a nine-criminal-count complaint from Santa Monica, where the things originated, Bird entered into a plea agreement with the city, paying $300,000 in fines and restitution. “We are pleased that Bird and the city of Santa Monica were able to work out our differences regarding licensure,” a spokesperson for Bird told the Los Angeles Times.